The Quinnipiac women's rugby team defeated Marist, 23-7, Sunday at Alumni Field in the program's first home game. “Let’s go Bobcats!” could be heard throughout the Quinnipiac campus on Sunday afternoon. Not for a volleyball game. Not even for a field hockey contest. Rather, a new fall sport at Quinnipiac. Instead, fans wearing “inaugural game” yellow T-shirts flooded Alumni Field to watch the Quinnipiac women’s rugby team win its first home game in school history, as the Bobcats defeated Marist by a score of 23-7. Stephanie Hasher, Jacqueline Lilly and Allison Gnys combined for four trys for the Bobcats, who have won two straight games. They made history at 12:02 p.m., as Quinnipiac kicked off to a Marist squad coming off its first loss of the season vs. Rutgers on Sept. 18. The Red Foxes controlled the field early on, as five Bobcats penalties in the first few minutes of play aided in giving Marist ideal field position. However, the Bobcats were able to strike with 25 minutes left to play in the first-half, as Lilly, a sophomore, converted on a try that put Quinnipiac (2-2, 2-1 MetNY) on top 5-0. Hasher would also add another try to the board for the Bobcats before the end of the half. 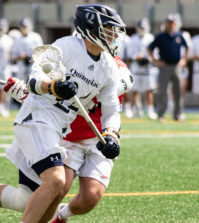 For the rest of the match, Marist found itself outmatched by a lively Quinnipiac defense and aggressive offensive attack. Hasher scored once again just four minutes into the second half, and Gnys also contributed with a try late in the match. 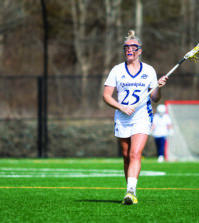 Even as sophomore Heather Carr scored for Marist (1-2, 1-2) with 23 minutes to play in the second half, the Bobcats never looked back and cruised to their second win. Quinnipiac head coach Becky Carlson praised her team’s performance. One of the reasons that the Bobcats were able to succeed in particular was due to their defensive effort. 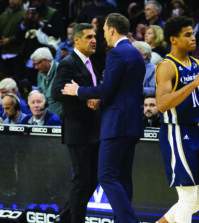 After allowing 75 combined points to Rutgers and Eastern Illinois to start the season, Quinnipiac has only let up 12 over the past two contests. Being the first home game, it was more so the chance to prove the fans that women’s rugby is legitimate that consumed Hasher’s mind. “We’ve been working so hard. This was our time to show everyone what we’ve been working on,” Hasher said. Quinnipiac will face a difficult Vassar team Oct. 8 at Alumni Field. For now, though, Carlson will enjoy the victory and look even further into the future of Bobcats rugby. “I’ve been waiting 10 years to see something like this … rugby at Quinnipiac now looks like a marketable product,” Carlson said.